....to help boost the size and quality of the U.K.'s science and engineering expertise. Supported by Inmarsat, the academy aims to create a network of outstanding teachers and space scientists. The network will use the inspirational context of space to teach science, technology, engineering, mathematics and geography to students and their teachers. Led by the National Space Centre on behalf of the U.K. Space Agency, the Science & Technology Facilities Council and the European Space Agency, the academy will be supported by a range of universities, colleges and sponsors. "The National Space Academy will use the U.K.'s world-class expertise in space science to further boost the size and quality of the UK science and engineering pool, providing the U.K. with skilled workers who can boost the growth of our economy," said David Willetts, U.K. minister for universities and science. Inmarsat, Vega Space, Astrium GEO Information Services, Rolls Royce, Logica, the Garfield Weston Foundation and the Ogden Trust have all committed funds to the academy. 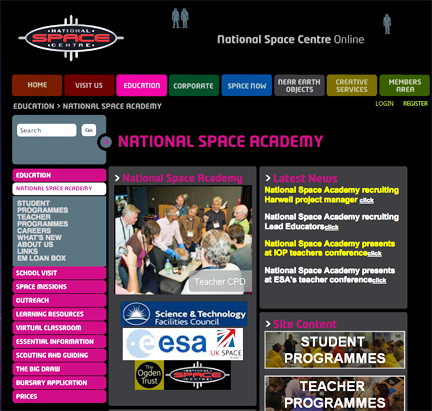 Professor Sir Martin Sweeting, chairman of the National Space Centre, said that a three-year pilot program run in association with the East Midlands Development Agency was a great success and showed that students respond positively to the subject of space as a context for learning. Sir Martin said, "We have evidence of improved attainment in exam results and teacher effectiveness, and a greater likelihood of students choosing science and engineering-related subjects at the next stage in their education."